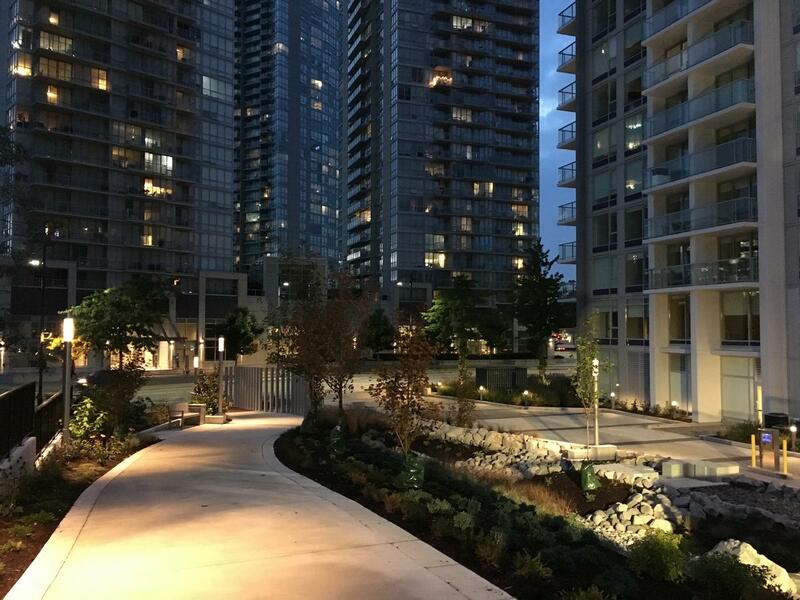 Concord Pacific has launched marketing for its next and final phase of its ‘Park’ development near King George Station. Named ‘Park George’ following Park Place, Park Avenue, and Park Boulevard, the twin tower project is now open for registration on the Park George website. The project which received 3rd reading on June 25, 2018 and Final Adoption just a month later on July 23, 2018, has moved swiftly through the approvals process, and is expected to begin construction within the coming year. 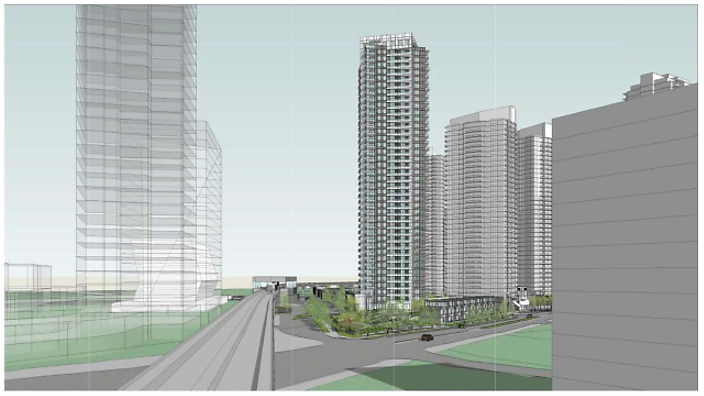 As reported back in June, the project will feature a pair of 35 & 39-storey towers adjacent to, and integrated with, Quibble Creek Park at 13778 100 Ave. Completion is targeted for Spring 2022. 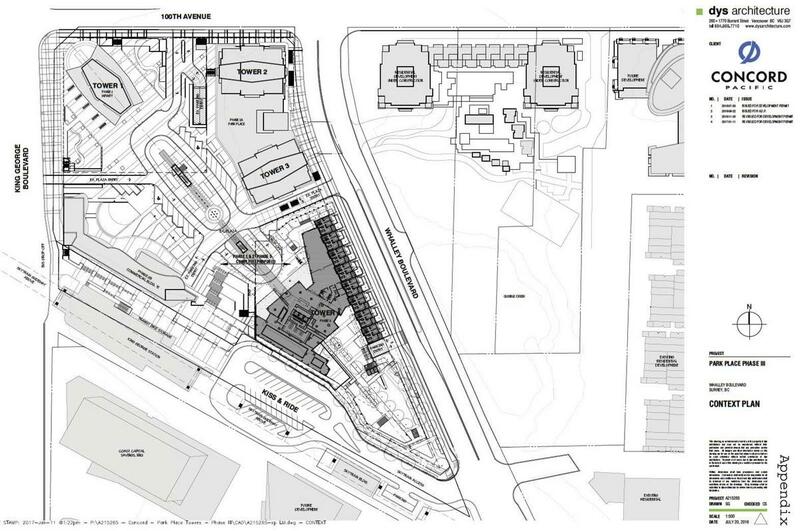 Concord proceeds to Council with next phase of ‘Park’ towers. 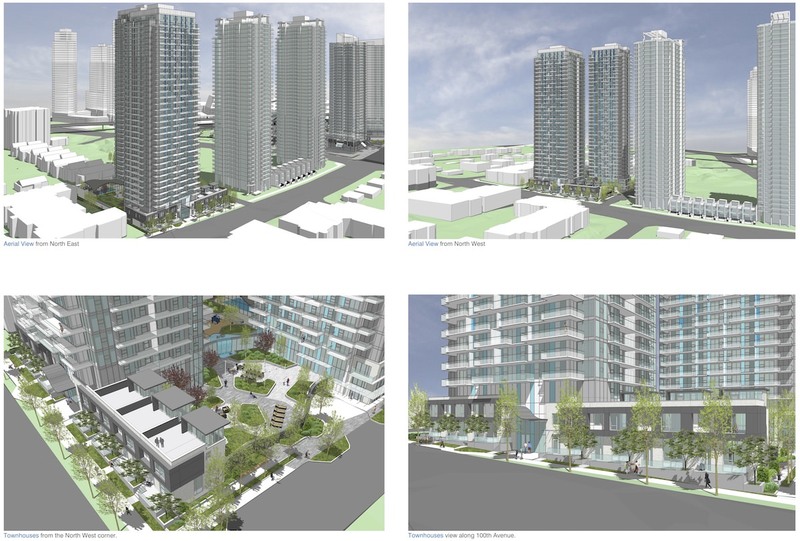 The next phase of Concord Pacific’s ‘Park’ community near King George Station is moving forward to Council on June 11 seeking approvals to develop a pair of 35 & 39 storey towers at 13778 100 Avenue. 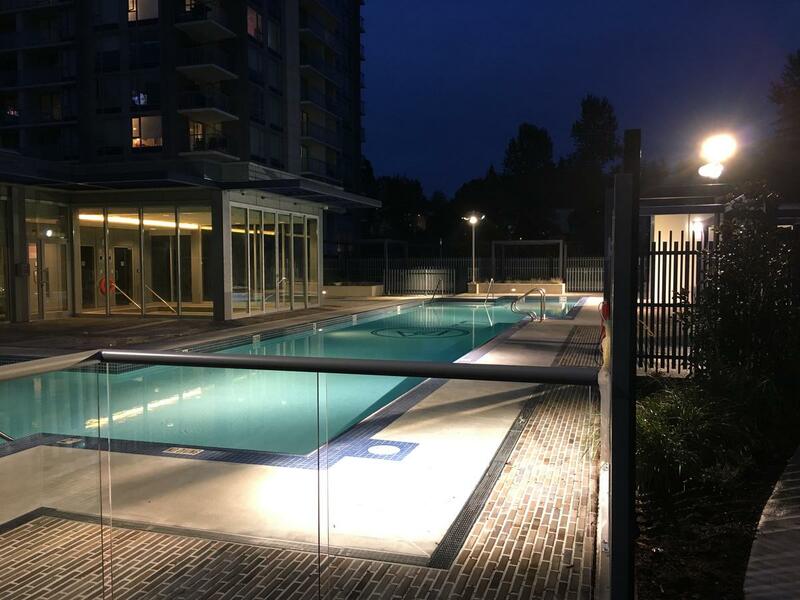 Located just to the east of their recently completed ‘Park Avenue’ towers, this latest, so-far unnamed project, will be the 4th phase of Concord’s ‘Park’ community following Park Place, Park Avenue, and the now under construction Park Boulevard. The 2 new towers will bring the total number of Concord towers in the community to 8. 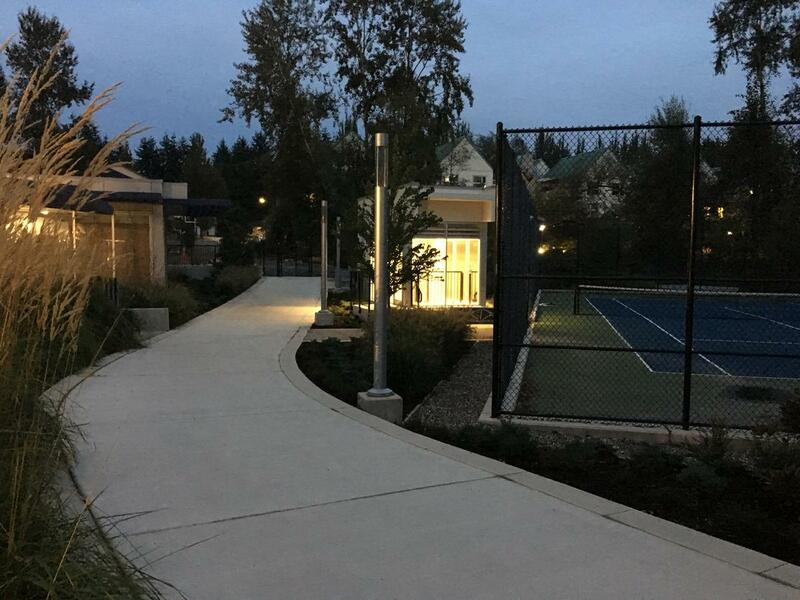 The ‘Park’ name refers to the community’s setting surrounding Quibble Creek Park. 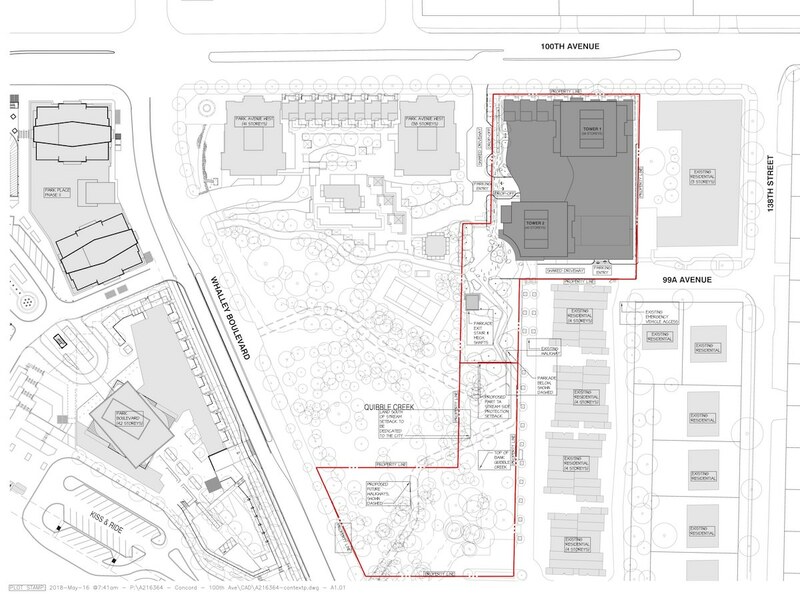 From the Planning Report to Council, Concord is proposing to subdivide the site into 2 lots – the north lot to contain the 2-tower project, and the south lot to be conveyed to the City as an addition to Quibble Creek Park. 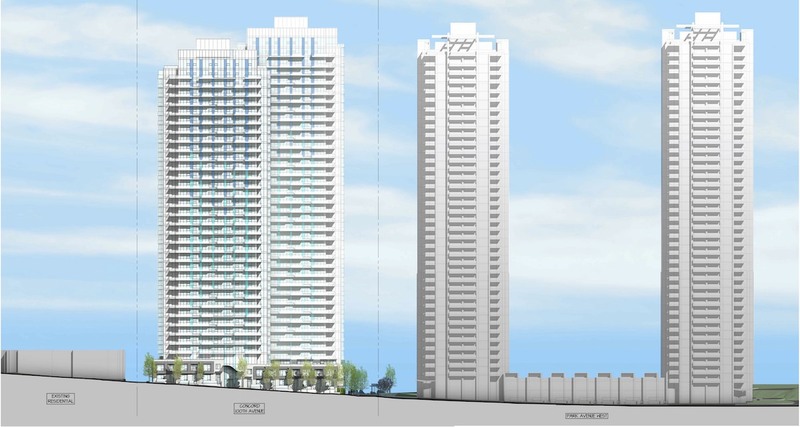 The northern-most tower fronting 100 Avenue will be 35-storeys (348 ft), while the southern tower will be 39-storeys (377 ft.), containing a total of 676 units, above a 2-storey podium consisting of indoor and outdoor amenity space, as well as 7 ground-oriented townhouse units fronting 100 Avenue. 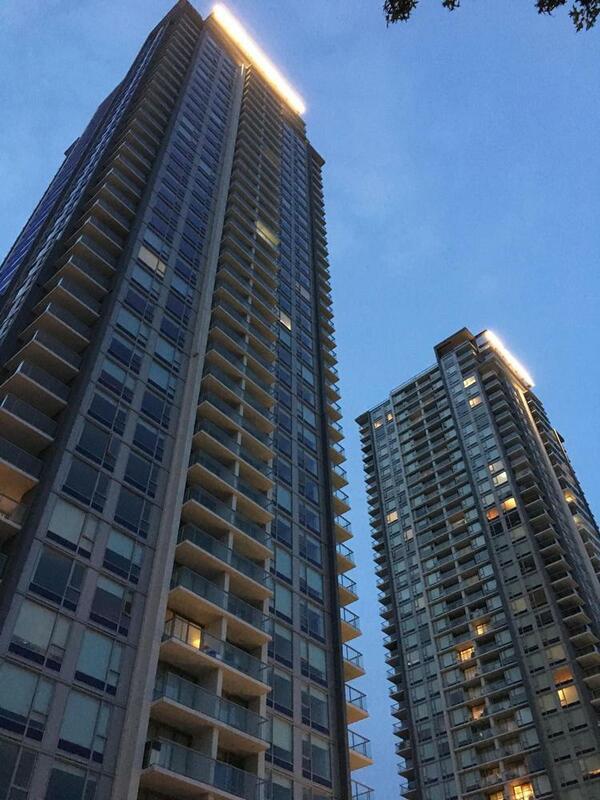 As for design – the towers feature balconies that vary in size, shape, and materials, to create visual interest. Vertical blue strips run down the towers fading from dark to light blue – referencing a waterfall. 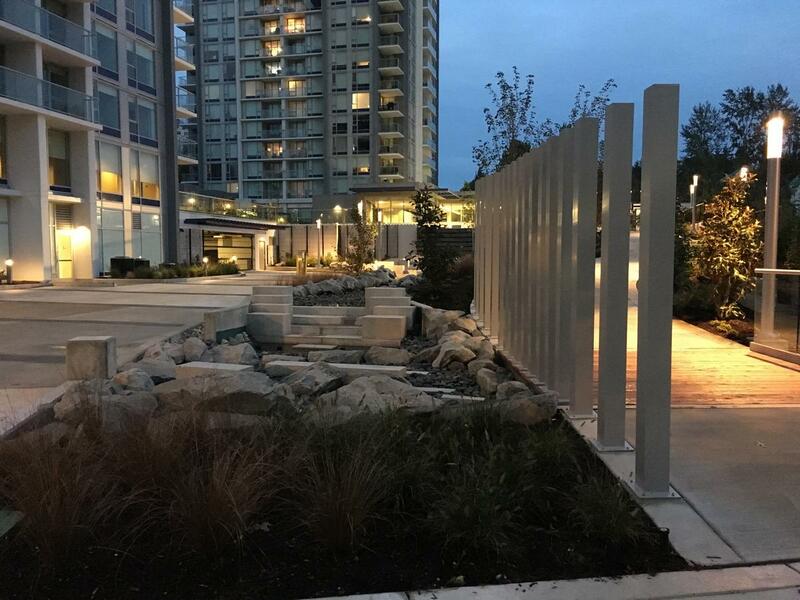 Other references to water include blue paving patterns containing in-ground lights and glass bricks within the pedestrian walkways leading from Quibble Creek Park to a water feature in the centre of a plaza. This water feature serves as a focal point that can be seen from the 100 Avenue entrance, the tower lobby, and greenway to the east. 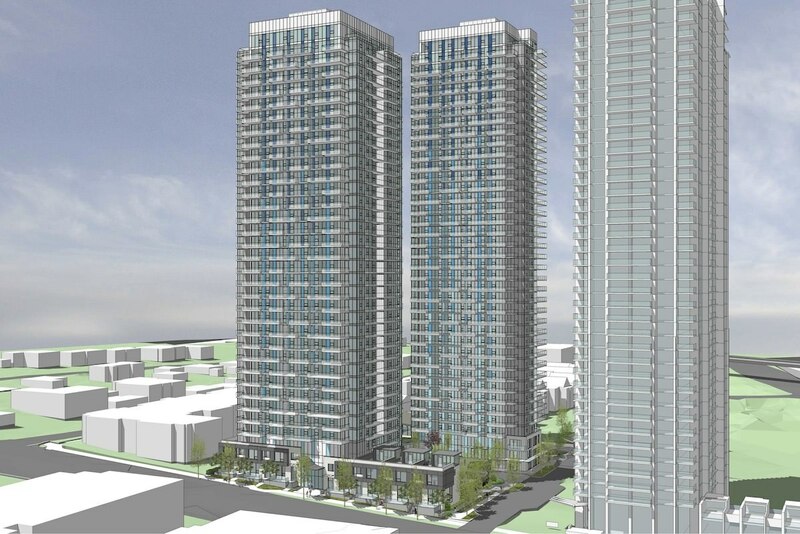 The two towers will connect and integrate with Quibble Creek Park to the south, as well as the Park Avenue towers to the west through an expanded greenway / path system. A generous sized lawn along the greenway will be provided as flex space for residents. Large planting areas with naturalistic character will help to integrate the greenway into the naturalized landscape of Quibble Creek Park. In addition to the project’s access to and integration with its natural park setting, other outdoor amenities to be provided on the podium’s roof include a sunbathing deck, outdoor yoga area, children’s play area and putting green. 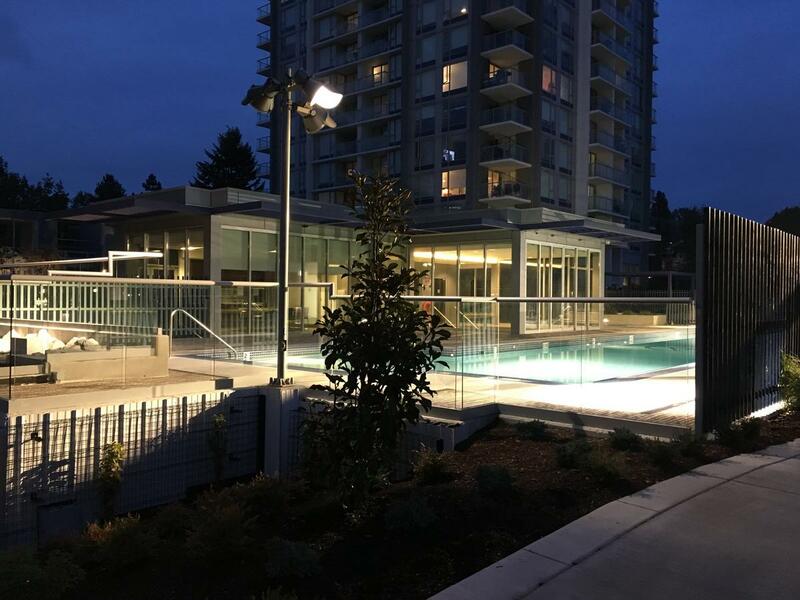 Indoor amenities include a gym, study and meeting room, pilates and exercise room, indoor pool, hot tub, steam room and sauna, change rooms, and table tennis. The project is targeted to be constructed and ready for occupancy by March 2022. 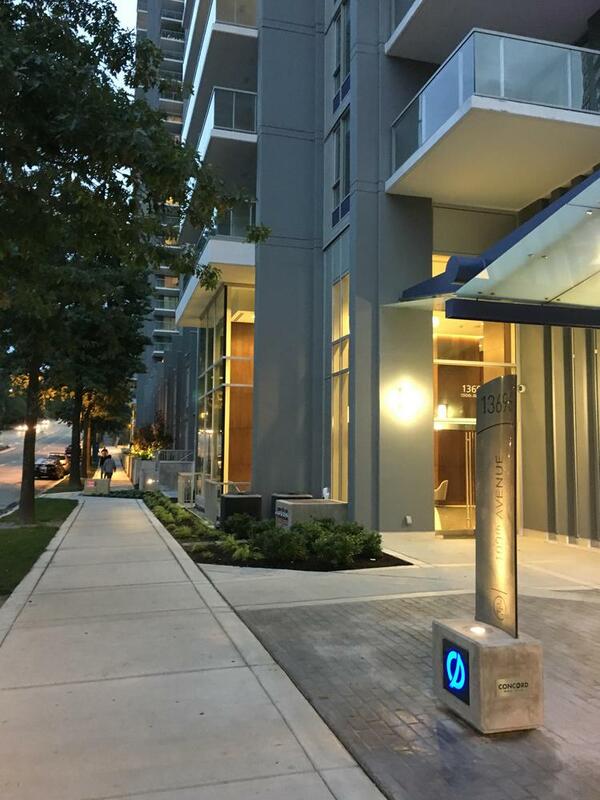 Concord Pacific’s Park Avenue West has finally opened near King George Station in Surrey City Centre. The tower which began construction in 2014, is the taller twin to Park Avenue East which opened in late 2016. Standing at 39 Storeys tall, Park Avenue West not only adds another condo tower to the area, but also completes the the Park Avenue development, bringing with it a number of resort-style amenities, new public plaza space, walkways open to the public, lighting features, and a corner fountain with spotlights that illuminates the building in changing purple and blue tones at night. Park Avenue is the successor to the original 3 Park Place towers at King George Station, and is set to be followed by Park Boulevard which is expected to break ground by next year. 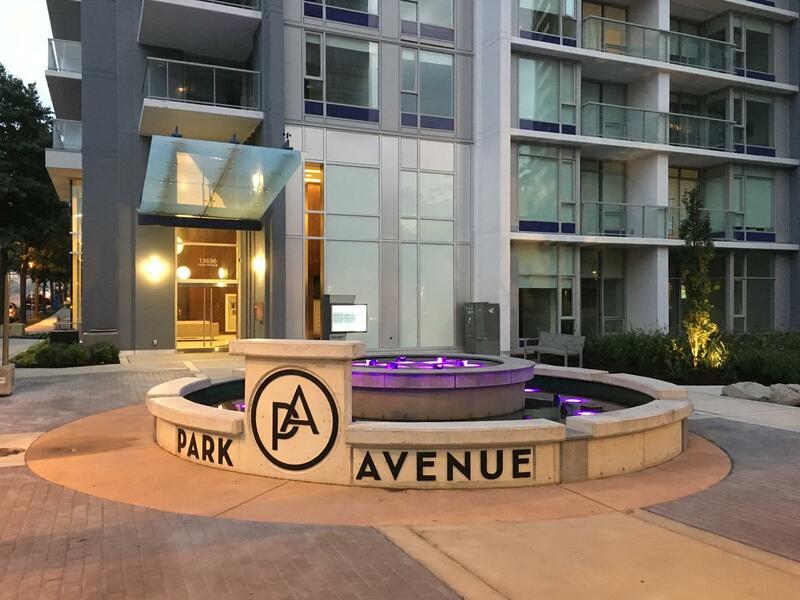 The opening of Park Avenue has quickly given a new feel to the area. 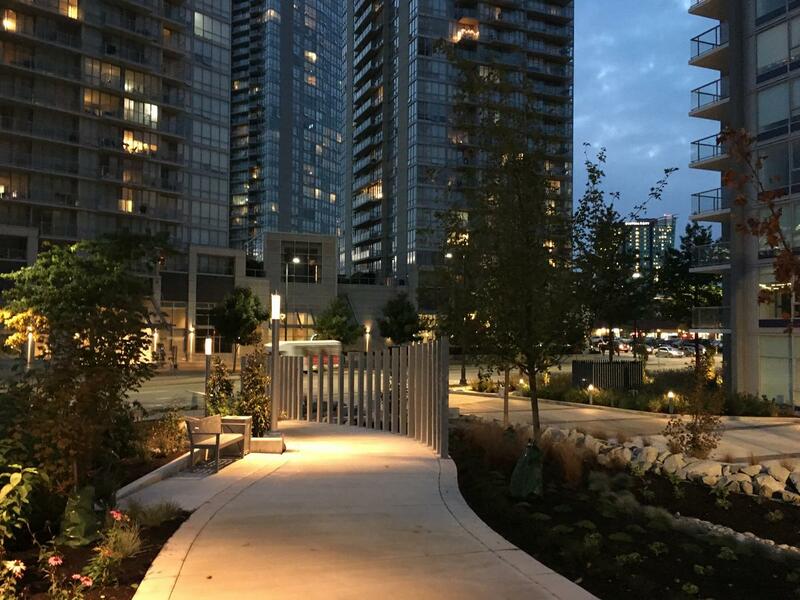 A walk through the new public plaza, pathway, and amenity areas provides a good sense the future feel of Surrey City Centre, and the King George Station area in particular, with the quality of urban design and landscaping on-par and comparable to areas of Coal Harbour and Concord Pacific’s False Creek neighbourhood. With a number of new developments set to break ground within the next year in the immediate vicinity, the area’s transformation will only continue. 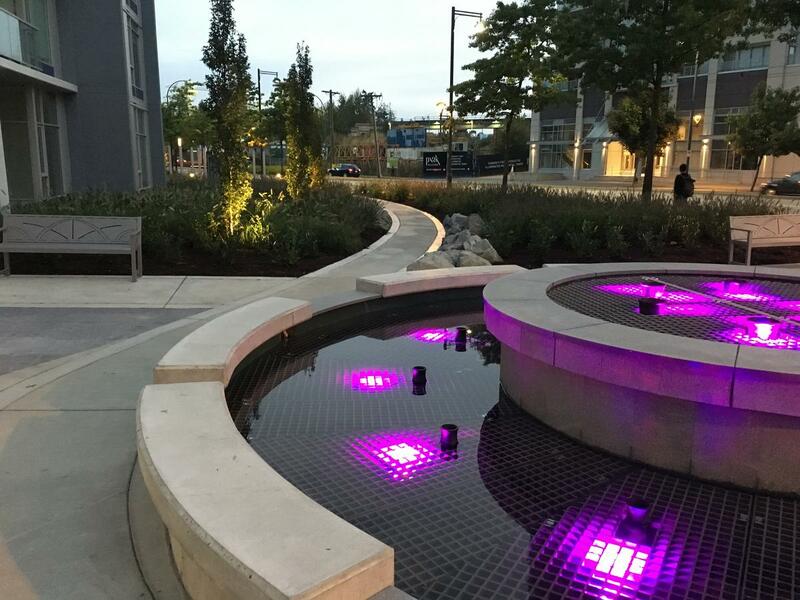 New corner fountain at Whalley Blvd + 100 Avenue featuring coloured spotlights. 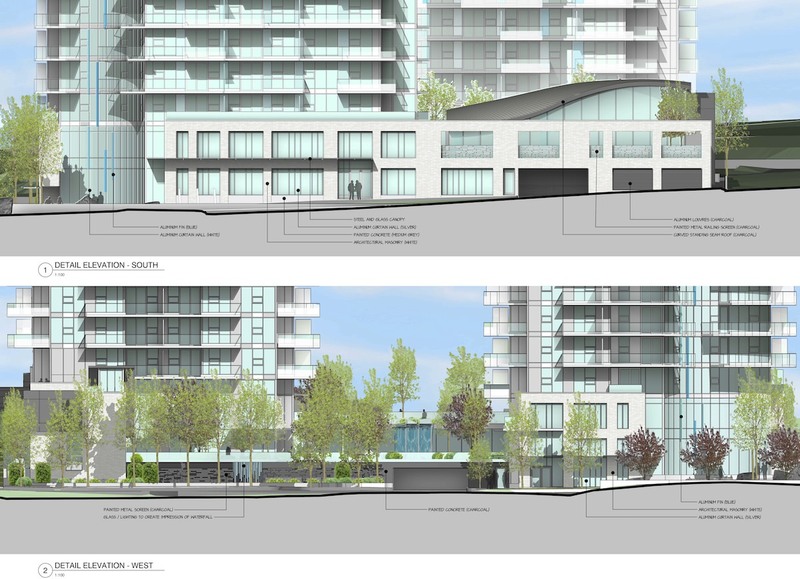 Concord Pacific’s final tower as part of their ‘Park Place’ development is heading to Surrey Council on Monday for Development Permit and Development Variance Permit. 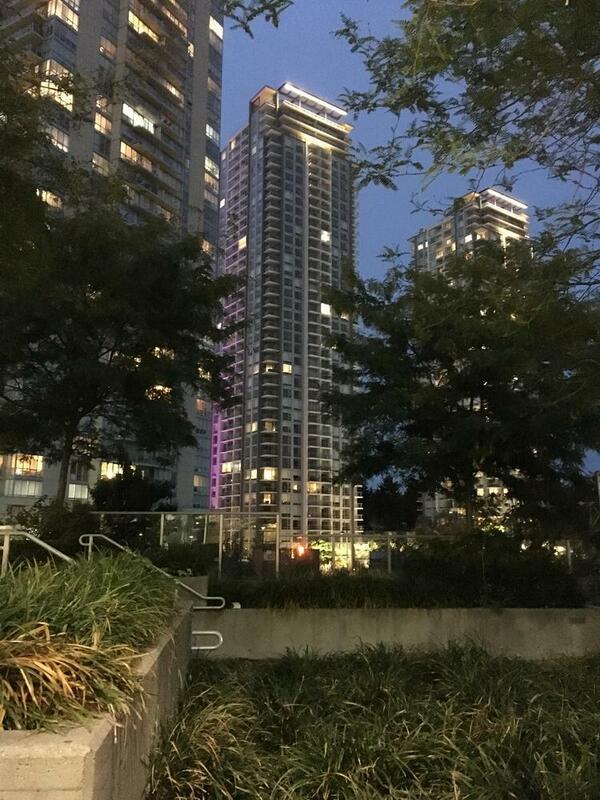 While the 42-storey tower is on the same site as the 3 original ‘Park Place’ towers, it’s been known since late last year that it will be marketed as a separate project ‘Park Boulevard‘ instead. 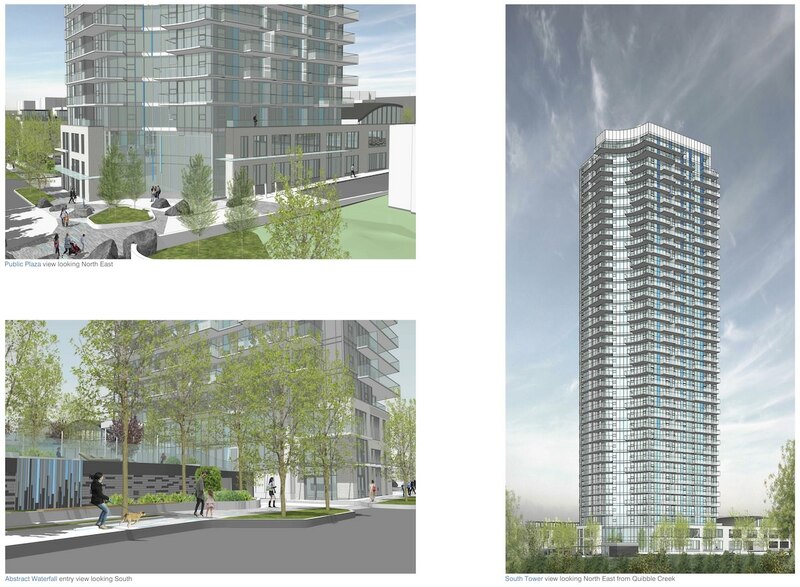 The tower will finally complete the block to the adjacent north of King George Station, adding a row of townhomes along Whalley Blvd across from Quibble Creek Park, and provide new public plaza space connecting to the existing Park Place plaza, retail, and transit station. 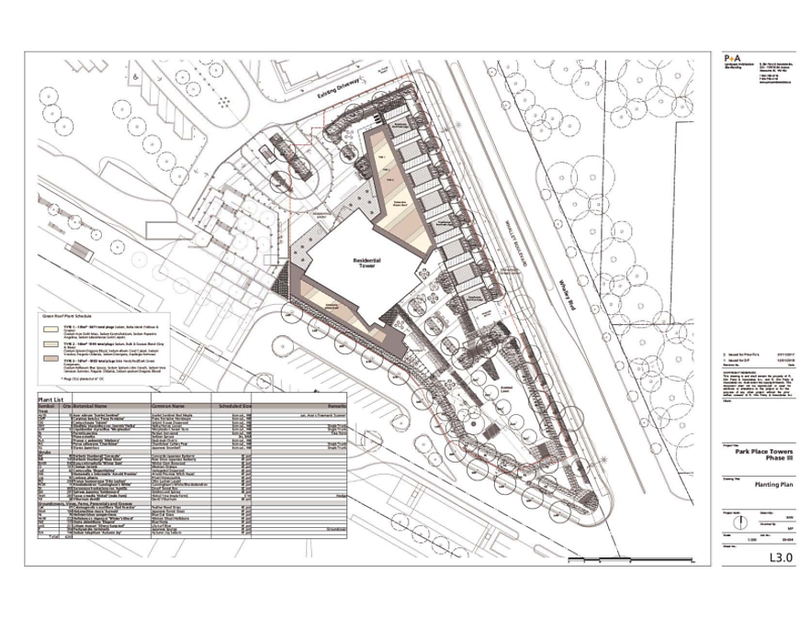 In total the project will add 419 new residential units to the area. While similar in design to the original 3 towers, it will be differentiated through the use of contrasting charcoal and white coloured materials, and slightly different massing. Its height at 42 storeys will also help to punctuate the “table top” skyline in the vicinity. With the DP and DVP moving forward, and the tower already under marketing it’s possible that the project could see start of construction by the end of the year or early 2018. 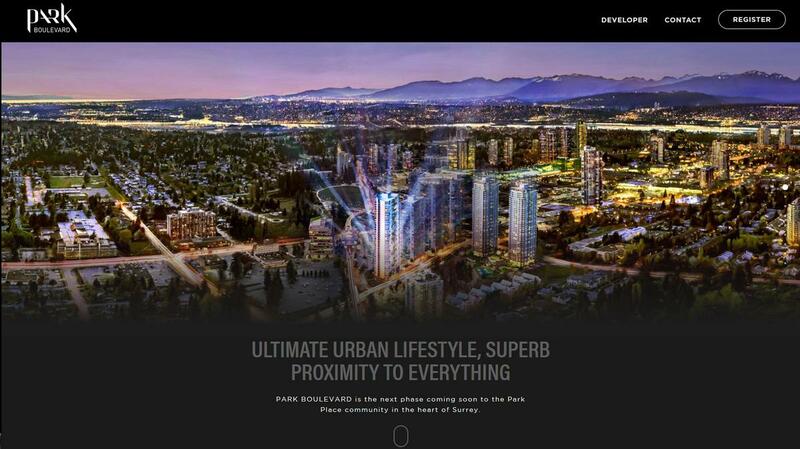 Concord Pacific’s next phase of development near King George Station has recently entered pre-sales, with a new site now up at www.parkboulevardliving.com for potential buyers to register. 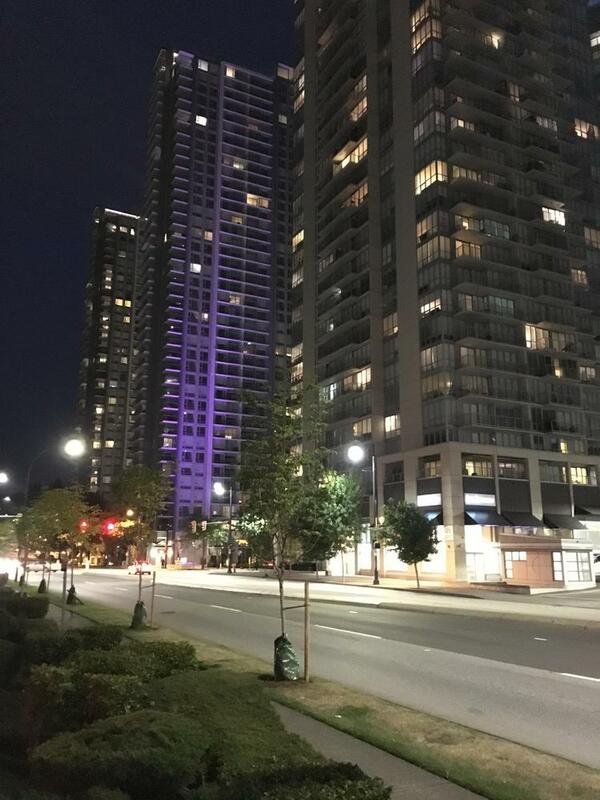 This next phase will add a 6th tower to the Concord Pacific community in Surrey, following the original 3-tower Park Place, and 2-tower Park Avenue developments. 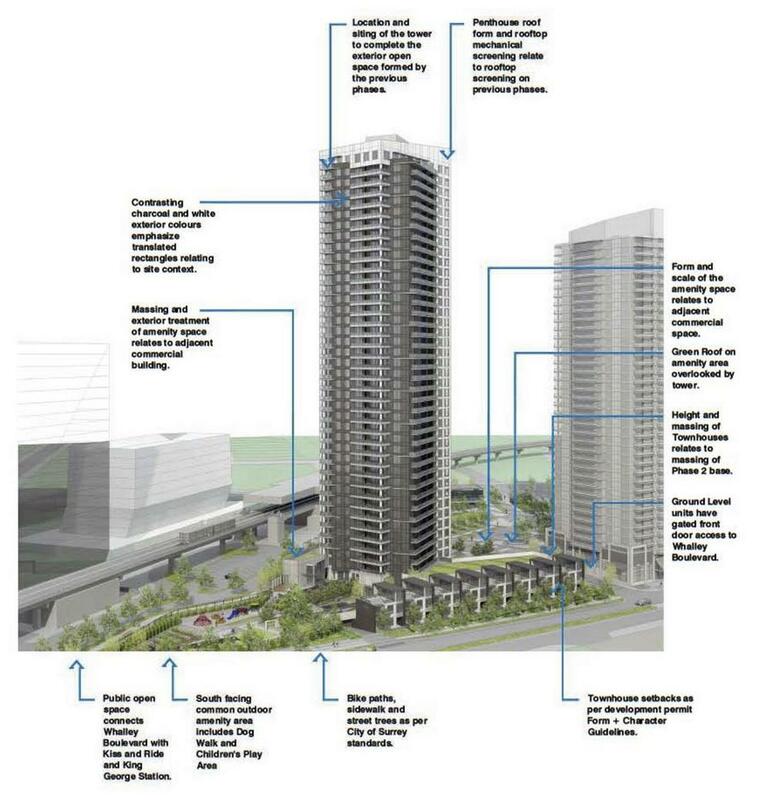 Concord first submitted a development application for the project back in July 2016 for a 42-storey tower on the site, which is slightly higher than the previous towers constructed which are in the 36 to 40-storey range. 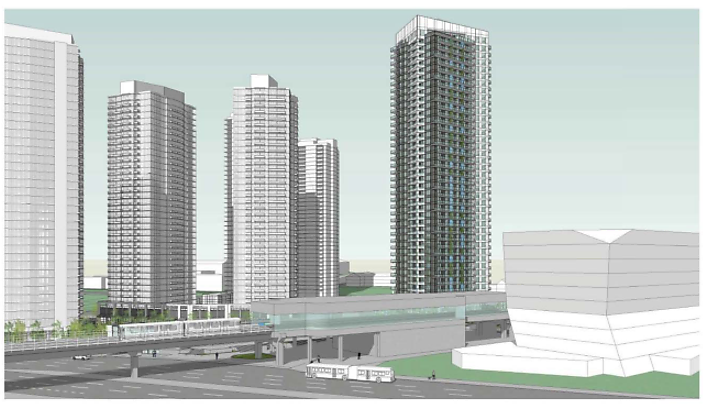 Despite an application for a single 42-storey tower, a rendering on the front page of the Park Boulevard site depicts what appears to be a tower of less than 42-storeys, as well as an additional shorter tower on the site. 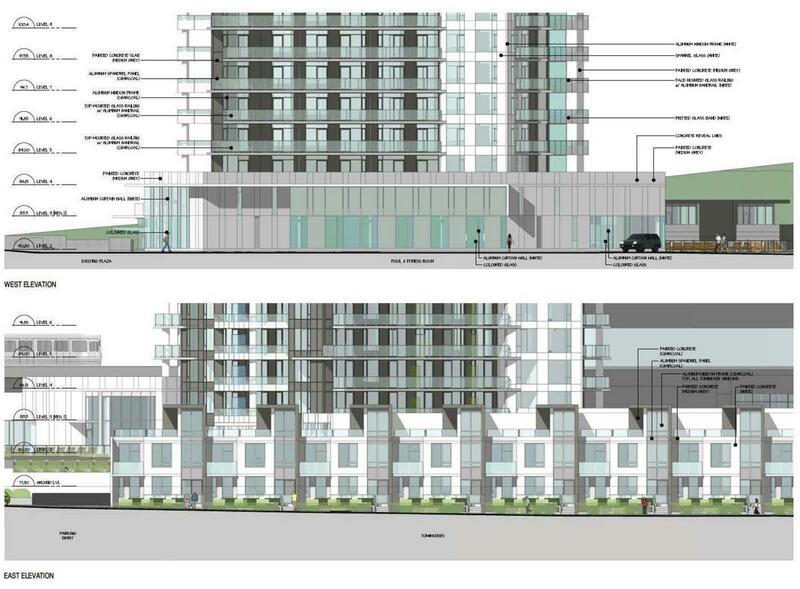 While the rendering is likely inaccurate and just a placeholder, it remains unclear whether Concord intends to develop a 2nd tower on this site as part of a separate application. If so, this would be consistent with the original plan for the site, initially developed by Korean developer Jung Developments as Infinity in the late 2000’s. Concord took over the project in 2008, re-branding it as ‘Park Place’ after Jung Developments was forced to bail on the project mid-construction during the 2008 financial crisis. 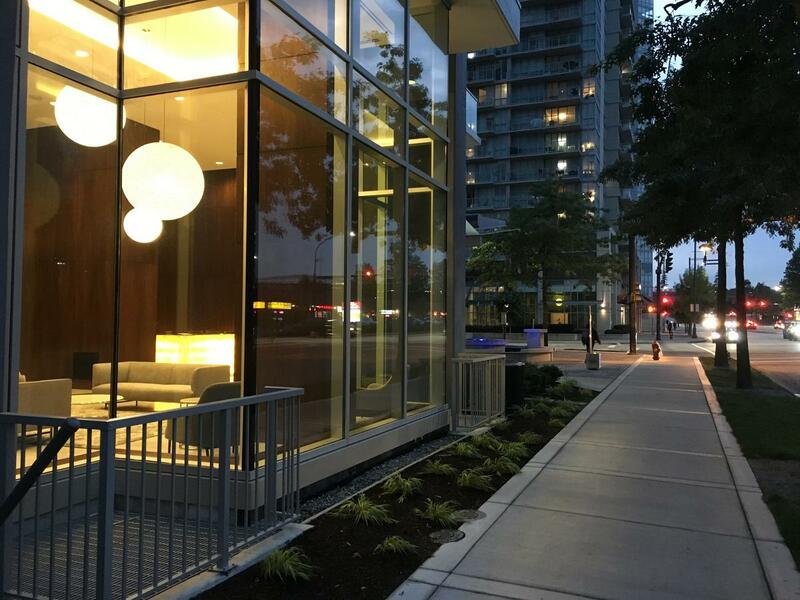 Concord Pacific’s Park Avenue is beginning to transform the look and feel of 100 Avenue. The East tower is now topped out with the West tower catching up. A row of townhomes that line 100 Ave between the 2 towers are beginning to form a nice streetscape with the mature tree canopy already in place. A new parking meter has also recently been installed indicating that there will be on-street parking which should help to buffer traffic from the sidewalk to create a better pedestrian environment. Park Avenue is expected to be completed later this year / early 2017. 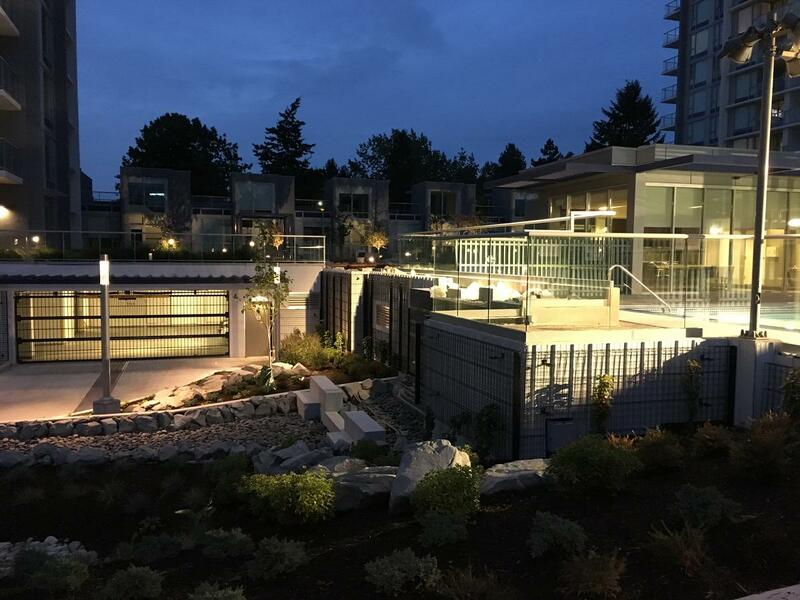 The development features numerous amenities including rooftop lounges, tennis courts, a pool, spa, fitness centre, and golf. 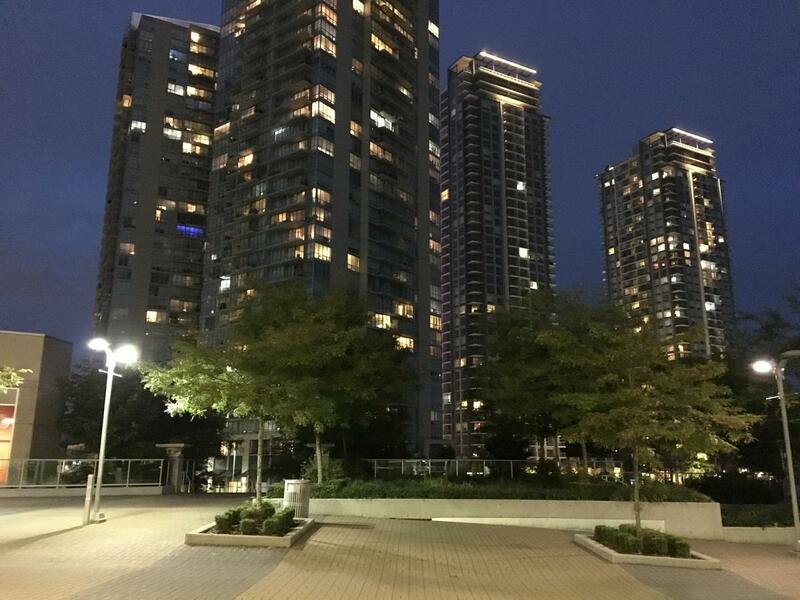 UrbanSurrey is a blog providing news, updates, and analysis on the growth and transformation of Surrey City Centre – the emerging downtown for the South Fraser region of Metro Vancouver, Canada.